In this article, we'll be taking an in-depth look at the Alesis V49 USB MIDI Controller and the top features buyers count as essential or desirable in a MIDI controller to see how the Alesis V49 stacks up. We will also compare the Alesis V49 to other similar products in its price range to check which one delivers the best overall value. What Is the Alesis V49 USB MIDI Controller? The Alesis V49 is a MIDI controller, driven and powered through a USB port. The V49 is manufactured by Alesis, a U.S.-based company that is part of the inMusic stable of brands of audio and musical equipment. When the Alesis V49 was released in 2014, it was touted as a step forward toward design simplicity, ease of use, and affordability. These characteristics are shared by nearly all Alesis products since the beginning of the company back in the 1980s. Before we look at the features and specs of the V49, let's see in short what a MIDI controller is and does, and what basic features buyers are looking for, especially in this price range —i.e. the lower end one. MIDI stands for Musical Instrument Digital Interface, a data standard that breaks down audio and other information into events that can then be beamed to various devices that can control the output. A MIDI control device, such as the Alesis V49, can send parameters such as notation, pitch, velocity, vibrato, and many others to another MIDI device or to a sequencer for recording and further processing. The thing to remember when you see a MIDI keyboard is that without a connection to another device or some form of output, the keyboard itself will not make any sound. It is not a digital piano, even though it looks like one, so it cannot produce music on its own. In some MIDI keyboards, the number of keys may be as large as 88—the same number in a piano—and the key “actions” can be of varying sensitivities and weights to mimic the action and effects of real piano keys, which make louder, sharper sounds the harder and more quickly they are being pressed. Also, there should usually be many more programmable controls on a larger keyboard. Now, let's look at the features and specs of the Alesis V49. The Alesis V49 offers the basic features of a MIDI keyboard but includes some additional components that can make it useful not only as a home studio input device but even as a live performance instrument. The Alesis V49's basic features most users are after include 49 full-sized, square-front keys with synth action, ten basic assignable buttons and knobs, and pitch and modulation wheels. The keyboard also includes eight velocity- and pressure-sensitive back-lit pads for beat production or launching clips. Also, there is a port for a foot pedal, which can send or sustain data or other MIDI signals. In addition, popular production software Ableton Live Lite 9 is available as a free download. We've picked a few similar products available on the market to see how they compare. Since this is a basic MIDI, even though it comes with additional assignable drum pads, the learning curve for the product should not be steep. That said, absolute beginners are likely to feel a bit lost at first because the concept behind MIDIs, short of the idea of pressing the keys (which again, won't make any noise without additional components), can be a bit overwhelming at first. Again, this is a basic MIDI. Connectivity is a snap with plug-and-play USB. The sound is going to depend on a number of variables, including the action of the keys, which is not bad in terms of feel and responsiveness for an entry-level MIDI keyboard. Talking again about the keys, while there is nothing particularly wrong with them, a number of users have complained—sometimes loudly—about the velocities of the keys being all over the map. This seems mostly a failure to understand the degree of programmability available for a MIDI keyboard. Factors like velocity can be changed to improve performance. Otherwise, for the money especially, this is a well-built little keyboard. This is a full-featured performance drum pad and MIDI controller, but it is still considered a “budget” product, even though it costs a lot more than the Alesis V49. The extra features make the MPK249 more than worth the heftier price tag. Basically with MIDI controllers, the better the machine is at offering users control of their output signals, the more complexity gets introduced because users have to get accustomed to more knobs and sliders and buttons. This is actually a good thing in the long run even though there is a bigger learning curve for this device. Other than that, the device is easy to set up and use. This MIDI keyboard is powered through a computer via the USB connection. The controller offers the user much more on board control over their work than a less expensive, basic MIDI keyboard. For the money, this MIDI keyboard seems to have it all. It includes 49 semi-weighted, full-size keys with aftertouch (the latter providing a much more natural feel and control of the sound with the keys). In addition, the 16 RGB-illuminated MPC-style pads offer a superior sensitivity and velocity rate. The device comes with 24 assignable knobs, faders, and switches, along with the standard controls such as the mod and pitch-bend wheels. The is a mid-price-range intro MIDI controller that does offer more keys and more controls than a basic machine like the Alesis V49. One point the Alesis folks stress is that the layout design and Launchkey 61 board seem a bit cramped, but Novation is also enabling folks to take advantage of its integration with Ableton's session view. As you may have noticed, none of these machines are difficult to set up. All of them are powered by a USB cable connected to a computer. That said, some users notice and complain that the compact keyboard and drum pads of the Novation Launchkey 61 are not so easy to use. The company and experienced users point out the layout is designed to take advantage of the Launchkey's tight integration with the Ableton DAW. USB and pedal connections. With 61 velocity-sensitive synth-style keys and plenty of additional controls, including 16 full-color RGB velocity-sensitive drum pads, output sound with the Launchkey 61 can be sculpted with a fair degree of control. This machine is more likely to be compared to the MPK-249 than to the much less expensive Alesis V49. It is true that the MPK-249 has a better layout of controls and more sensitivity in its keys and pads than the Launchkey 61, but it is also true that the Launchkey 61 is about half the price of the MPK-249. So, as always, when you pay a bit more, you should expect to get a bit more. Overall, the Novation Launchkey 61 is not a bad machine for the price. Two-year limited warranty for recent devices (built since 2016). One year for devices prior to that. Keys and control layout may feel cramped. This entry-level MIDI controller is quite basic – no fancy layout or pads and sliders, but it has a nice feel similar to that of a professional device. It features 49 full-size velocity-sensitive keys, a volume fade, octave up and down buttons, pitch and modulation wheels, and sustain pedal. It also comes with free DAW software and 3 VSTi's, which you can download on the devs’ website. This semi-weighted MIDI controller does what is supposed to do and more. With this controller you will not have to hammer down as the key bed comes with enough resistance as it is. One major downside is the lack of tactile feel in the keys, but at this price point we aren’t bothered. This is a great controller for inputting some notes and other minor work especially when traveling away from your full-size keyboard. The sound on this controller is excellent, comparable to the output of some premium production suites designed by and for professionals. Thanks to the plug-and-play connection, you’ll just need to plug it into your MAC or PC, restart the computer, and you’re set. Also, the unit works with most DAWs and doesn’t require any drivers to be installed. Nevertheless, for iOS devices, you’ll need to buy a USB adapter from Apple first. This MIDI controller is quite basic. It is a mix of a weighted keyboard and a synth but it looks and feels like a professional-grade controller unlike other devices in this price range that may feel like toys. On top of that, for what it has to offer, you cannot beat the price. All the MIDI controllers we've examined will reliably interface with a computer and appropriate software and beam those MIDI signals that will be shaped into music. The differences in devices like these brought up by advanced users may seem fairly esoteric to beginners. 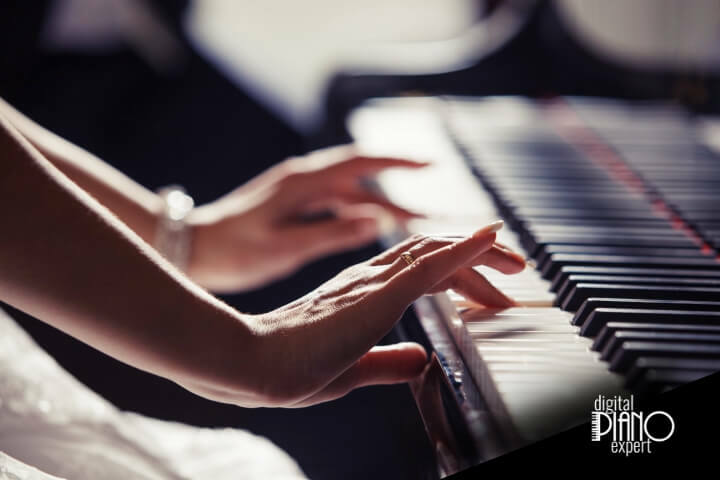 For instance, the “feel” of the keys may not be as much of an issue if a person has never learned to play on an acoustic piano. But key “sensitivity” and “velocity” are important issues even to players who are solely trained on MIDI keyboards. Also, drum pad and control buttons and sliders have increasingly become expected parts of the MIDI keyboard layout, so just having an array of responsive, weighted, piano-like keys is not always going to be enough to justify a price in the opinion of many buyers. While the Alesis V49 is a really good value for the price, in our comparison, the Akai Professional MPK249 was the best all-around value, with the highest rating (4.6/5 stars).